We know now that the number of deportations on Monday was 136 people. Also we heard from different sources that the heads of the people that were brought to Athens on Saturday night were covered with black bags so that no witnesses could see the faces of the deported. Repression is high on the island at the moment. We hear from different sources about an increasing number of deportations. According to our information a lot of people were deported in the last days directly from Mytilini to Turkey. We heard about 175 people but cannot confirm this number or the exact way of deportation at the moment. What we are sure about is that there are a lot of arrests and that the people are brought on ferries. The arrests happen in Moria as well as on the streets. We know of several cases of people being arrested while walking in the city. People also told us about severe violence being used by the police during these arrests. At the moment we assume that people from North Africa (Algeria etc) are the most at risk for being arrested. Some people, according to one of our sources at least 60, have been brought to a prison close to Athens a few days ago. It is a prison for refugees, many of them are accused of having committed a crime. What it is really beside a deportation prison is a prison for so called troublemakers. They face between 6 and 18 months of prison, we were told. For both the people being forcefully brought to Turkey and to Athens the numbers could be significantly higher than what we heard so far. We know that some of the people were at the moment of their arrest still in the middle of their asylum process. At this point we can only guess what excuse will be given for the detaining of these people. Nontheless we want to make clear that no arrest and no deportation can ever be justified. Instead of having access to a proper asylum process in a country of their choice, the people on lesvos are imprisoned in this island for months. The asylum procedure after the Eu-Turkey-Deal in March is not only completly untransparent but basically illegalizes the majority of refugees until they are granted asylum…if their process ever finishes. Lesvos is a legal gray zones with a lot of things happening that are not supposed to be known. That makes the people on the island being in constant danger of being arrested…even if they actually have the precondition to get refugee protection in any (other) European state with a asylum system. In the next days we will work on getting a better picture of the situation and will hopefully soon be able to publish more infornation! If you are reading this and can give us more information or contacts please write us on noborderkitchen@riseup.net! Today on September 24th, more people than all the last weeks took the streets of Mytilini in protest. We therefore completed a month of ongoing protest in the capital of Lesvos- every week with more and more people participating. Monday this week it was shown again on the one hand that the people of Moria unite and will not keep quite about being detained in this island often for more than 6 months without perspective. On the other hand it also showed that the situation here is dangerous. 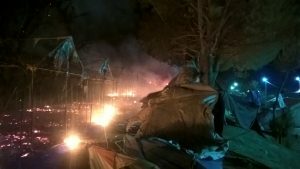 Part of the danger is created by the state: the camp burned because people live in extremly overcrowded plastic tents- a condition that would not even be okay for short term emergency accomodation. The other part of the danger is shown in the attacks from local fascists. We can only repeat over and over again: Lesvos is not a refuge. Today people from Moria and other camps showed together with local comrades that none of us will stay silent when we face the inhuman conditions Fortress Europe creates on this island. The great support from local comrades made this weeks demonstration even more powerful than the last. Their presence was really felt and showed that we are not alone in this struggle. Although the riot police was present, the demonstration stayed as non violent as the last weeks and several families with children therefore joined the demonstration. Also after the demonstration the NBK team did their best to make sure that there was no police repression and violence on refugees and that all the people got “home” safely. Today we also, like the weeks before, marched together through the center to the port. This week the demontration was not only as big but also as loud as never before. The slogans “We want freedom!”” No Moria” and “Open the borders” could be heard far and wide. The night from Monday to Tuesday was very rough for all of us. Monday started with a very big and powerful protest for freedom and against the unbearable living conditions in Moria from the people in the camp. 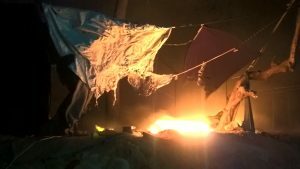 In the evening the situation in the camp escalated and Moria camp took fire. At nightfall the fire was extinguished but most of the tents and the family compounds were already burnt down. Thus thousands of people including many families were left in the dark without a sleeping place, water, food or blankets. Meanwhile the police blocked the road to Moria camp forcing people fleeing the burnt down camp back. To Moria the only other road from the camp to Mytilini through Moria village was blocked by a racist mob and several people were attacked. In this night we and friends were supporting people with our solidarity and necessities like water and blankets. With double the refugees living in Moria than it was initially built for, Moria camp is completely overcrowded. The people are forced to stay in overcrowded tents or outside, there is not enough food or water and very bad hygienic conditions. On the day the fire broke out, September 19th, there had been no lunch and the water had as usually been cut for hours. Some refugees started protesting and some managed to set their imprisoned friends free. 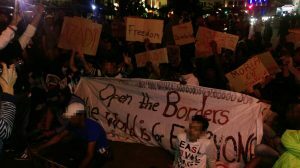 They protested in front of the EASO offices to ask for their asylum requests to be processed and to demand answers about the reasons for their deportation. The EASO staff left the camp from a back door without responding. At that point the peoples anger grew, they gathered in front of the camp in protest and in the spirit of the recent demonstrations, started marching towards Mytilini town. There are a lot of stories of what actually happened on Monday. Some say the people wanted to march to Mytilini town to protest against the border and Moria camp, others said that they heard about the fascist gathering in Moria village and wanted to make a counter demonstration. 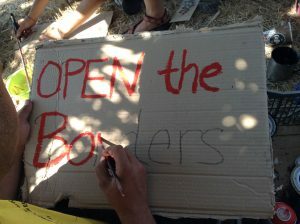 No matter what is true, it was a common protest of people from different origins and language groups together against the borders, the bad conditions in Moria camp and fascism and racism in Lesvos. It is unclear whether they were stopped by the police or if or they returned voluntarily, but the people turned around and went again to Moria camp. In any case anger grew even more and soon people started clashing with the police. During the fighting a fire started spreading through the camp. It is unclear who set the fire, but as far as we know the flames started in the dry fields outside Moria camp close to one of the unofficial entries to the camp and because of the strong wind quickly expanded inside the camp. 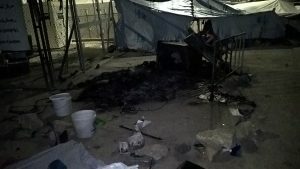 In Moria camp all constructions and the tents are made of easily inflammable material so together with the piles of trash lying around in the camp everything took fire. Fortunately no person got seriously injured in the flames but the firefighters didn’t reach the camp in time to save the belongings of the people. Hundreds of people lost all they had but what they were wearing at the time of the fire: passports, documents they need for their asylum process, diplomas, money, clothes, tents, sleeping bags – all gone. Instead of getting shelter and new blankets the people were confronted with the police and the locals blocking their way out. The main road was closed by police buses not letting any refugees out or any other people in. Meanwhile a big group of racists reached Moria village. 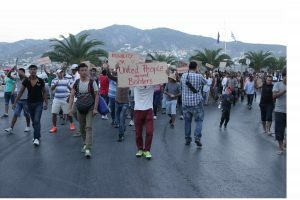 Previously they had marched in Mytilini town for a nationalistic demonstration against Moria camp and refugees on Lesvos. They also already attacked and beaten two girls on the same day, from who one was hospitalized. The mob in Moria village consisted of at least 100-200 people armed with sticks and knifes. At this point we don’t know if it was mainly locals or also organized fascists from other cities. We were told of refugees defending themselves with stones against the fascists. Only a handful of police men held the locals back from beating up the refugees trying to get through to Mytilini. Some of us from No Border Kitchen tried to get friends and families out of Moria camp to a safe place. On our way by foot through Moria village we also were attacked and threatened with a knife. 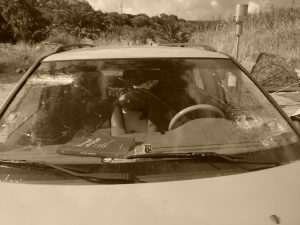 Also one of our cars got broken with an ax while the person inside was insulted and threatened to be beaten up. Luckily we run respectively drove away fast enough not to get physically injured. Now the future is unclear. While there is still a need for emergency help, for the rebuilding of shelters and distributions of clothes, water and food, the actual problems didn’t change. Moria is not a refuge and forcing people to claim asylum in Lesvos not a solution. Even if Moria is in the process of being rebuild, it will just become again the unlivable place it was before the fire. Also still people are arriving and the situation in Moria will continue to get worse. But even building a second camp like Moria as planned by the government is not a solution. We from No Border Kitchen are working hard at the moment to support the people from Moria. But we don’t only distribute blankets. We will also go on to show our solidarity and our protest on the street. We stand with all the people that were fighting the inhuman conditions in Moria on Monday and everybody that suffered under the fire on Monday. We want to be known that the fire in Moria was not just an accident. And the fight was not just a food fight. People were fighting for their rights to be treated like the human beings they are. Furthermore it is out of question who has to take the responsibility for the fire in Moria. Its the people that close the border, the people that force people into overcrowded camps build from plastic and lacking even water or food. Camps that lack conditions suitable for human beings will always be a source of fire. Today on Monday September 19th around 50 refugees that were locked up in the closed area of Moria camp liberated themselves with help of their comrades in Moria camp. They were assisted by refugees outside of the closed area to run out of the prison and protect themselves from their awaiting deportations. After that the people went to the EASO office inside Moria camp to demand answers, why they were supposed to be deported. The staff from EASO refused to speak to the refugees and fled the office. This led to a lot of anger within the refugees. Following that people at least 600 people inside Moria protested loudly and some also burnt trash and blankets. Today the refugees inside Moria camp showed clearly that they will not simply accept the worsening of the conditions in the camp and will protest against Europe closing the doors in front of them. Solidarity with all refugees fighting Fortress Europe and solidarity with everybody imprisoned by Europe’s border regime. Until everyone is free! Being on Lesvos for a refugee means being trapped. A Senegalese woman at the demonstration pointed out: “In Moria we are like prisoners.” The conditions in the camps are terrible and outside of the camps refugees have to face police violence and harassment, discrimination and exploitation by some of the locals (for example higher prices for goods and unpaid illegalized work). But what is worse for most people here is being unable to leave the island, to get to a country of their choice. Refugees are forced to register and apply for asylum in Greece: otherwise they are threatened with deportation and some were already deported. Others who applied for voluntary repatriation because they cannot stand the conditions here on Lesvos are waiting for months to return and leave the island, too. Young people full of hope for their future see the months passing unable to do something with their lives. They loose precious time they could use to do something, for example study or work, and fulfill their aspirations for their future. Many are unable to join their families in mainland Europe. Having already a long journey behind them, many more months of dangerous travels lie ahead for most of the people. Meanwhile asylum legislations get stricter and stricter and the borders more and more difficult to pass. People have to risk their lives to cross the frontiers illegally and many pay very high amounts of money to some that profit from their difficult situation. Others get to the limit of their strength by trying to get to mainland Europe with legal ways. Europe’s war on migrants must stop once and for all. We demand all borders destroyed and freedom of movement for everyone, no matter what citizenship, race, gender or age! Two days ago the Lesvos police paid us a visit while we were distributing food for the refugees living in the forest. They don’t want us to feed the refugees, they keep telling us that they should get food in Moria. But if refugees should rely on Moria they would rather stay hungry. In Moria the food is scarce and people wait for hours to get tiny portions. However we are not going to let the police oppression keep us from cooking with and for refugees! We are now trying to find a new long term spot where we won’t be bothered by the police. Meanwhile the stoves keep running. NBK Lesvos stands firm! Refugees welcome! 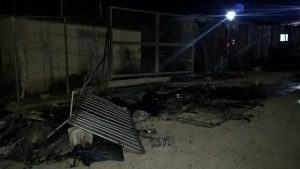 In the night from Sunday to Monday what started out as a fight between the Moria minors became an outburst of violence. Many minors and adults were badly injured and hospitalized and according to our information one person lost his life in the fights. Police and military left the camp unable to handle the situation. Families fled Moria fearing for their safety and many refugees prefer sleeping in the woods than going back to Moria. But no place is really safe for the refugees on Lesvos. Outside of Moria camp they fear police violence which regularly occurs. Moria is a prison, Lesvos feels like a prison too. The island is not a place for refugees to stay! 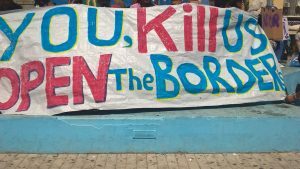 We demand: Open all borders! Let the refugees leave the island of Lesvos! Free movement for all! Many people from Moria camp protested yesterday and demanded a solution from EU for their horrible situation here on the island. First the people demonstrated in a central square with a sit-in and then walked through the city towards the port. While walking their shouts “we want freedom” could be heard way beyond the ports gates. Everyday boats with refugees cross the sea from Turkey to Lesbos. The arriving people are imprisoned in Moria-camp, that was established as a so called hot-spot in March. The conditions there are unbearable and are getting worse every day. Lacking food, broken showers and totally overcrowed sleeping areas are the daily life in the camp. “We are humans, not animals” stated one person in the protest, and said that even anaimals have a more rights and a better life in Greece than the people in Moria. But not only the humanitarian conditions need to be critizised. 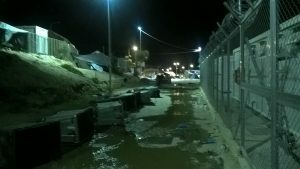 Moria camp is a prison, surrounded by barbed wire and protected by the military. The fences of the camp reflect europes fences: not only Moria is a prison, for most people all Lesbos is. Not able to leave to Athens or another European country to acces their right to asylum, and also not allowed to return to Turkey, people are trapped on the island. The duration of their imprisonment unknown. We want freedom! Shouted the people in Mytilinis streets. We also want freedom, we want to destroy all borders and end europes war in migrants.